What a lovely day it was yesterday. Swelteringly hot, fluffy white clouds skimming across an eternally blue sky giving just the occasional shade relief. Before the sun got too high in the sky I went down to the beach (pictured) for a stroll along the coral sand. I was determined to at least get wet this time, and so it happened – though not entirely as intended. Walking on the coral sand is a bit of a nightmare if you’ve got sensitive feet as I have. I feel literally every bump or lump under the soles of my feet. So imagine what it is like stepping on a bit of sea-worn coral, ground down to something approaching smoothness over many moons but still enough to cause havoc to this sensitive creature! Where I lost my footing - deceptive eh? And then, added to this, is the fact that what’s lying on the beach is the small stuff which the sea has thrown up. Conversely, just a few yards from shore there are blooming great lumps of the stuff flying around (shadow underwater on picture). So if you wade in to the water where there’s a lot of coral debris, these lumps fly at your legs through the water. A few weeks back P&D’s last visitor apparently emerged from the water in the same spot with his legs cut to shreds. I was anxious not to repeat the scenario. So I found what I thought was the sandiest part of the beach, with few lumps on display, and I waded in to my knees. The water was deliciously warm and really quite clear, but not clear enough for me to notice that the sand suddenly shelved away to a not-quite-so-shallow spot! All at once instead of paddling I found myself sitting in the water, and that’s when I discovered the current. Not a strong one, but the waves are powerful enough just here. Not soon was I sitting down but I was pushed over by a passing wave. In no time at all I’d gone from wet below the knees to total immersion!! I must say it was fabulous, but the thought of getting hit by coral lumps, let alone stepping on the stuff did, I’m afraid, rather put me off prolonging the experience, or attempting to swim. So I returned back to the house and elected for the swimming pool instead – altogether safer, if rather more boring. Whereas the previous day I wouldn’t go near it, yesterday you couldn’t keep me out of it! A grill in the sun followed, slapping on high SPF Piz Buin. I’ll want my money back if I don’t have a delicious tan when I get back to blighty. There’ll be words I can tell you! Around midday we set off for our afternoon jaunt, a pattern now well established (home am, out pm til whenever). P&D drove me first to Holetown, just up the coast from here, and then we turned right and headed inland to Mount Misery, at 1035 feet high, one of the highest points on the island. I’ve no idea how it came by its name, and I have tried to find out for you this morning but to no avail. However, I suspect we can all think of at least one cause for its name. From Mt Misery you can see the Caribbean to the west and the Atlantic to the east. The next landfall eastwards from Barbados is Senegal in West Africa, just over 3000 miles away! From Mt Martha we headed further east to the parish of St Joseph to visit Hunte’s Gardens. 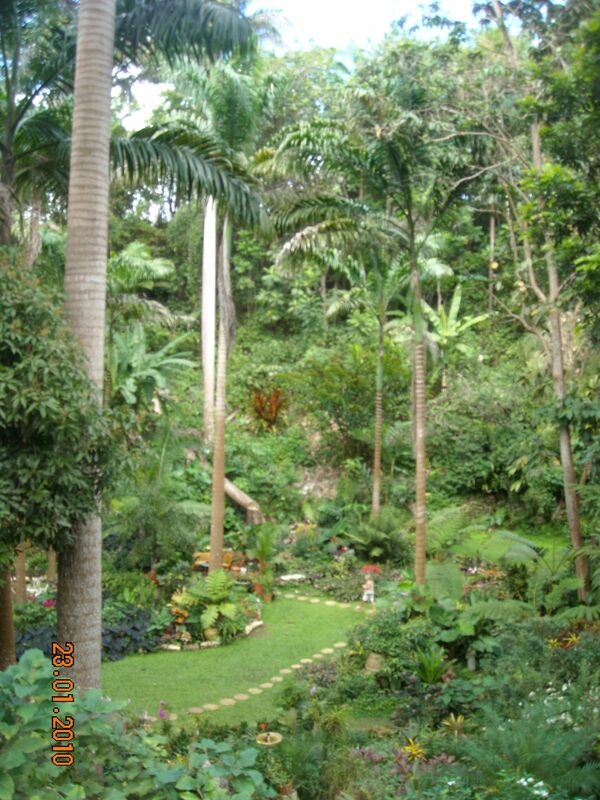 This is a fabulous botanical garden established not so many years ago by its own Antony Hunte. He’s a white Bajan native, a descendant of the entirely settlers, and he was certainly an eccentric character; I warmed to him immediately. His gardens were simply stunning, created in an enormous collapsed cave: my photograph really doesn’t do it justice – the tall palm trees were over 200 feet tall. I was completely spellbound by the gardens around me when suddenly Maria Callas started singing Puccini through the trees. It was at once weird and yet fitting in that arena, and given the big hole that the garden was created in, the acoustics were brilliant. After our perambulation around the garden we joined Antony on his verandah for a glass of rum punch, my first tipple of rum ever. I was rather taken (warning bells!) with it. Rum consumed we headed off again, arriving a short time after at Bathsheba, which made me feel like I was a Thomas Hardy character. We had a delicious snack lunch (and another rum punch!) at a lovely cafe overlooking an Atlantic beach, massive waves crashing onto the shore in their first landfall for thousands of miles, and then bumbled back to St James passing through plantations of sugar cane, banana, paw-paw, mango and apples. I’m fascinated by the placenames (usually named for the original plantation owner thereabouts), the plantations themselves and the chequered history of the sugar trade. We have to accept that slavery is part of that story unfortunately, but my take on it is that at least the white settlers did come to their senses eventually, albeit when forced to comply with an act of parliament. 300 years of plantation history is quite something and I’m determined to find out more before I travel home and to read about it thereafter. So expect a plantation blog soon! Back home again more swims in the pool followed by a relaxing evening doing, frankly, not a lot. We talked about plans for today, but I’m so relaxed I can’t for life of me remember what the agenda is. Once I’ve finished this posting I’ll zip down to the beach for a wade, maybe an immersion too, and then more grilling by the swimming pool for half an hour. 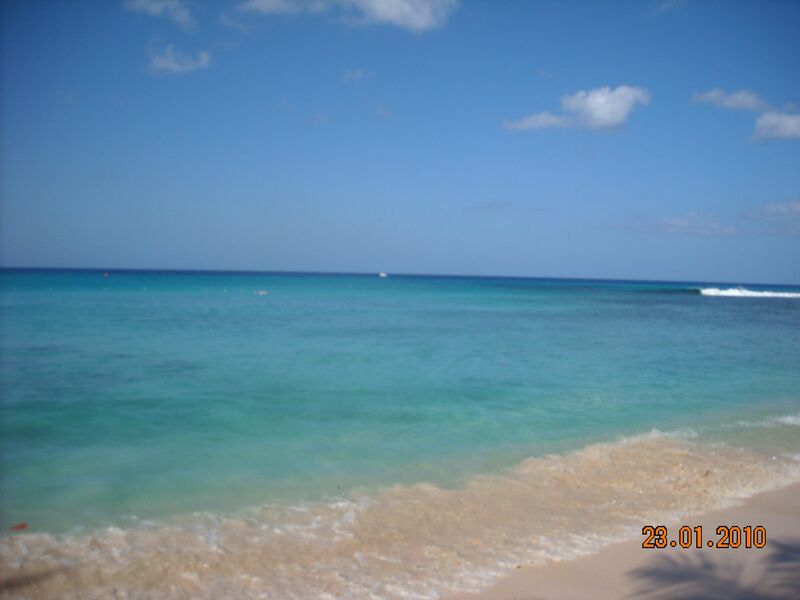 This entry was posted in Barbados 2010 and tagged Barbados, Maria Callas. Bookmark the permalink. who would have thought going for a wee paddle could be so fraught with danger! Hope no body saw you land on your bahookie- well, nobody that might have photographed you doing it..
Ah, all in good time for today I’m going to visit the Mount Gay Rum Distillery! There are people here who are very interested in knowing more Rum Facts!